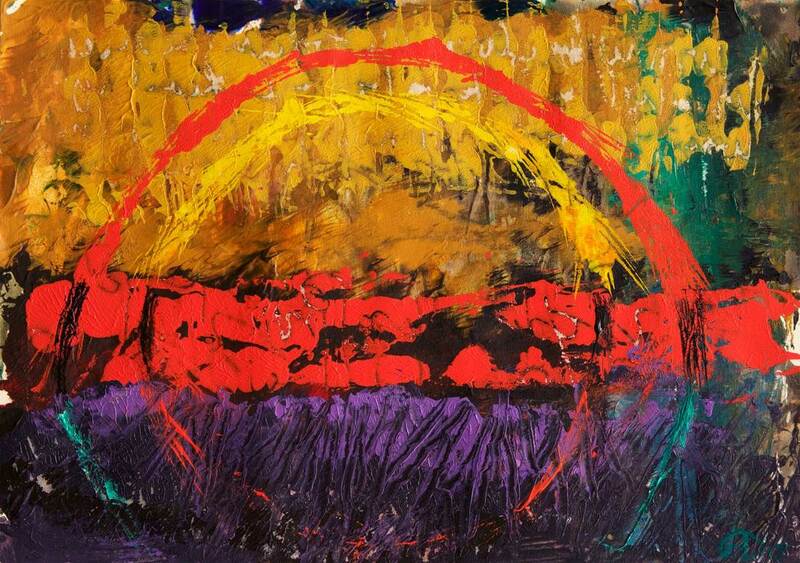 Titled "Edge of the Eclipse" this 12" (30.48 cm) x 9" (22.86 cm) original acrylic monoprint on paper is bold in it's design and aesthetic appeal with intense black, red and golds set against brilliant purple, green blues, and smatterings of white with an appealing texture to the it. The image goes right to the edge of the paper and it is signed in the lower right hand area. Done in professional artist Golden and Winsor & Newton acrylic paints. These are hand pulled, one generation printed originals. The process is one in which paint/ink is put down on a plate (plexiglass, etc. ), the image is constructed on that plate, paper is put down on top of it, pressure is applied to the back of the paper and then the paper is pulled off the plate. The image is then transferred onto the paper. This results in ONE print only, hence the term mono (one, only, single) print.